Also available in 1 gallon size. Most conomical for large industrial/commercial applications. 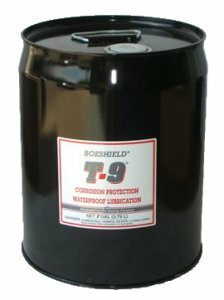 The 5 gallon size of T-9 is intended for use in industrial and commerical settings where large quantities are needed. Q. Hoe long does it take for Boeshield T-9 to set?